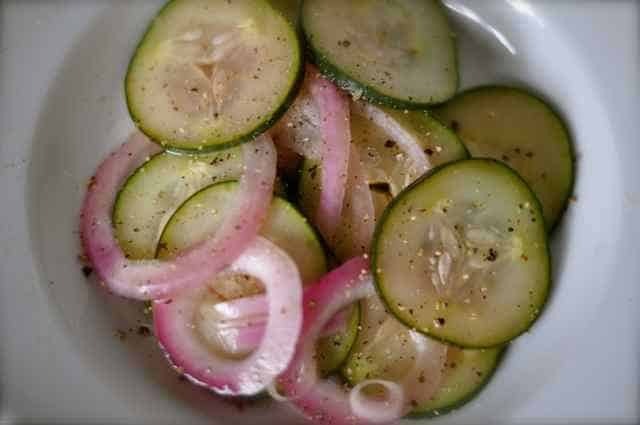 Make a fresh tasting cucumber salad anytime this is the perfect light side dish with any meal. Sliced Cucumber salad was a staple of mine when going up. All of my family had huge gardens. cucumbers were one of the most plentiful crops we had. These “refrigerator pickles” were on the table at dinner most every night. This is a great side dish, and is very low calorie. You can sweeten with Splenda if you desire. You can also let the cucumbers sit in this mixture for about 12 hours, drain, and then combine with sour cream. Growing up we always had a bowl of this in the refrigerator. Sometimes we would drain the liquid and add sour cream for a variation. 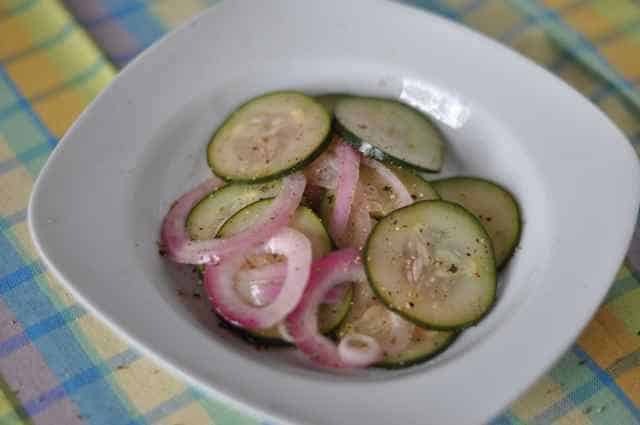 Place cucumbers and onion into a bowl. In another bowl mix together combine sugar, vinegar, vegetable oil, salt, and pepper. Pour liquid over sliced cucumbers and onions. Store in an air tight container. Refrigerate a couple of hours before serving. These will keep for a week in the refrigerator. A single guy who has never purchased a cucumber in my life (70 yrs.). Made this recipe exactly using balsamic vinegar. Simply delicious and easy. I love cucumber salad but the amount of sugar is way too much. If it is too sweet for you as well try less and less sugar till you are satisfied. That is one of the beauties of cooking, you can always adjust a recipe to your personal taste. I have learned there is no arguing taste, you just enjoy what you enjoy. This is a childhood favorite for me, thanks!